For the first time today we have had trouble getting the phone to link with the computer to update the site. It seems that the number of bars on the phone signal indicator have little to do with how easy it is to get data through the phone. I am sure that things are going to get more difficult in Russia, so maybe it is good that it does not work too smoothly now …. More rain today as we headed out of Vilnius in completely the wrong direction (travelling west rather than east ….. not the wrong road!) towards the Baltic Coast. We thought that we still have time for the detour as we are not due to cross the Russian border until 15th August. 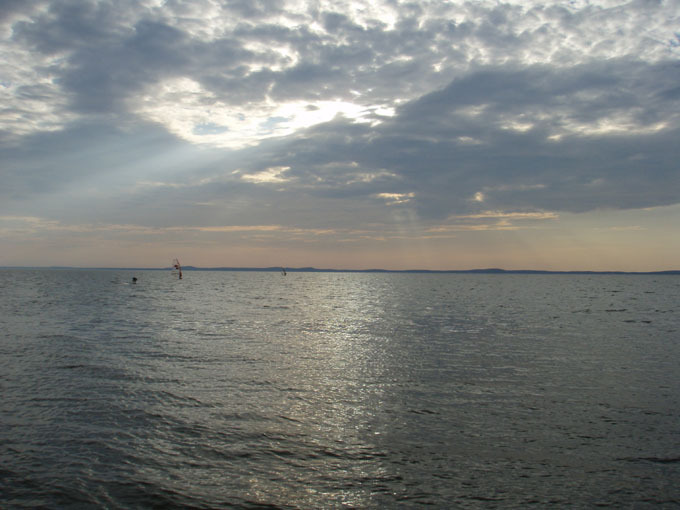 The first place that we got to was Vente which is right on the tip of land on the Kursiu Marios, which is like a giant lake formed by a long sand spit (98 km long) that runs south from Klaipeda and is half Russian and half Lithuanian. I had not really taken in the fact that there is a bit of Russia called Kaliningrad which is completely separate from the rest of the country which borders Poland to the south and Lithuania to the north. Look on a map …. its odd and I am sure is a story worth reading!? We again decided to stay in a little campsite. We are either getting soft, or maybe just cant resist what seem to us as cheap campsites. Other than the two city campsites we have not paid more than about £10. When we got to this one, which is right on the water and very close to the lighthouse at the tip of the peninsular, the skies started to clear. 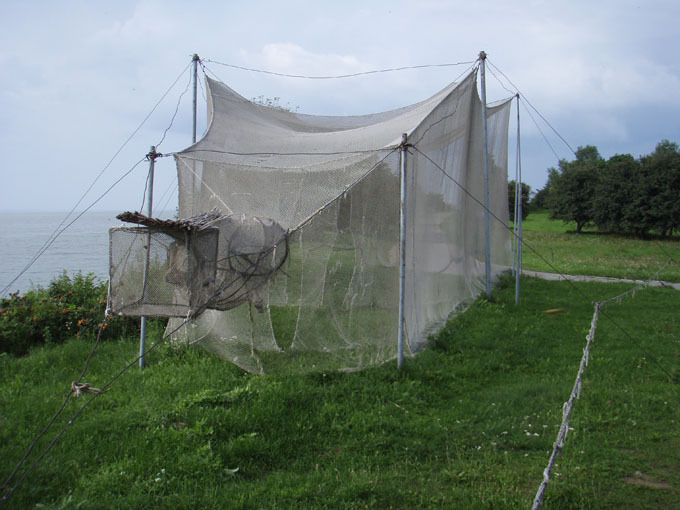 This tip of land has bird traps used to catch and ring the birds to survey migration and numbers. We then walked along the beach. The sea tends to be fairly calm as it is protected from the open sea by the sand spit. 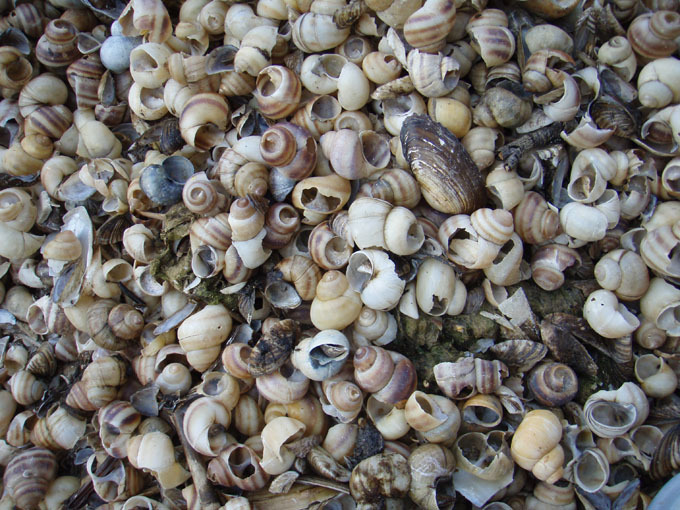 This means that the shells that are normally broken down to form sand are still almost whole. 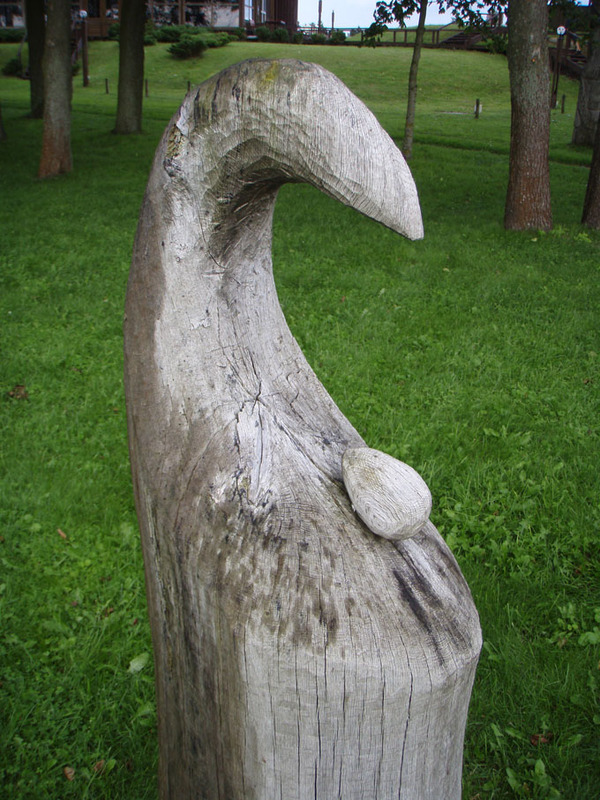 All around Lithuania we have noticed all sorts of outdoor wooden carvings. Every park and most villages have sculptures of all sorts. This campsite is no exception and has at least ten. Tomorrow we head up the coast to Klaipeda and beyond to spend a bit of time at the seaside. Maybe have a couple of days in one place, while we search for amber along the beach …. there is supposed to be lots washed up after storms. I’m sure its going to be sunny! !